Home Technology iMessage for Windows PC: How To Download and Use Apple Messaging App? iMessage for Windows PC: To all the people who wish to use Apple Messages app on their Windows 10/8/7 computer, this article is really gonna help you. You guys must have thought many times if there could be any trick to use Apple’s messaging application on Windows device. So here it is. We have two workarounds to get our job done. So here it is. Let’s get this clear first, there is no straightforward way to download and install the iMessage app on windows. You can still use iMessage on windows but it still needs a Mac for an advantage of this trick. This is not a straightforward trick but the only trick. Let’s have a quick look on installing Apple’s iMessage app on Windows computer. 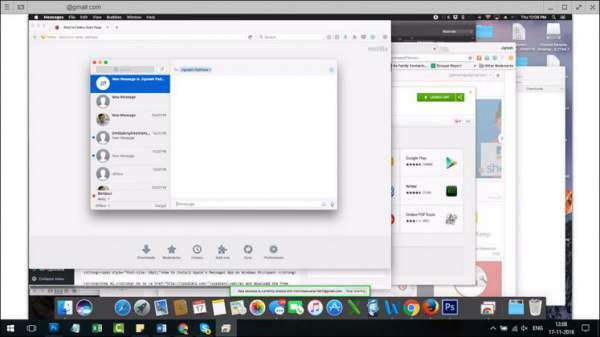 Step2:- Now download chrome and chrome remote desktop on both of your systems. Step3:- After installing, look for launch app and click on it. Step 4:- Download and install chrome remote desktop host installer on your Mac. Note:- Chrome Remote Desktop allows you to have access to another computer via Chrome browser or Chromebook And you can also easily access your apps and files securely. Step 5:- Use the code to connect both the computer and then you are good to go. Have fun with your iMessage on Windows PC. People who don’t have Mac, please don’t lose hopes. We have something for you. Download iPadian on your Windows computer. It’s a third party software which creates virtual iOS surrounding on WindowsOS and allows the installation of Apple’s popular Messages app on the Windows platform. Note:- iPadian is an iPad simulator that allows you to run iOS apps on your Win computer. The emulator features standalone Adobe air application. This could be really helpful to people who want iOS apps on their Win OS devices. However, this iPadian don’t have consistency and it open gate for Malware to enter your system so you will have to use it with extra precautions. Check: How To Take A Screenshot on Mac. Here is the process to install iMessage on your Windows device. Install .exe file on your PC. After installing, Launch iPadian on your system. Search iMessage in result bar. Download message app on your computer. Then launch the launch app and start your experience of iMessage on your Windows OS. Keep visiting our site for every update and how to articles.